Mahindra XUV300 sub 4 meter SUV will be priced between Rs.8-12 lakhs, ex-sh. 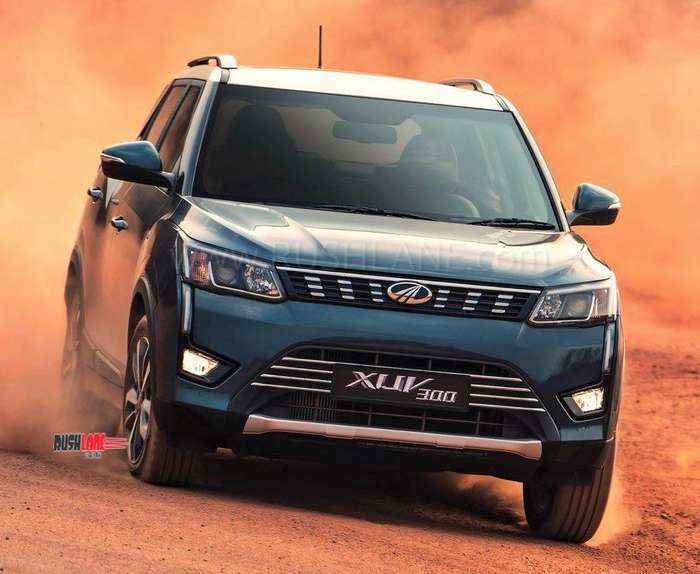 Mahindra XUV300 is set for launch on 14th February 2019. It will be offered in the sub 4 meter SUV segment, to take on competition from the Maruti Brezza, Ford EcoSport and Tata Nexon. Mahindra claims the XUV300 to be a driver’s delight. Their TVC featuring India’s champion rally driver, Gaurav Gill have already impressed enthusiasts. But is the XUV300 capable of doing all those things which were showed in the TVC? Well, the answer is yes. Powering the new Mahindra XUV300 is a 1.2 liter petrol engine offering 110 bhp power and 200 Nm torque. It also gets a 1.5 liter diesel engine capable of 115 bhp power and 300 Nm torque. Both engines are mated to a standard 6 speed manual gearbox. Automatic transmission could be added sometime later. The petrol and diesel engine is expected to deliver fuel efficiency to the tune of 17 kmpl and 20 kmpl respectively. At the media drive event, only diesel variant of XUV300 was on offer for testing. The video below shows 0-100 kmph acceleration and 100-0 braking performance of 1.5 liter diesel engine, top spec W8O trim. The test was performed on an empty stretch of road. 0-60 kmph was achieved in about 5 seconds, 0-80 kmph was achieved in about 8 seconds. Acceleration from 0-100 kmph took about 12 seconds. Braking from 100-0 seconds took about 5 seconds. XUV300 is the only car in the segment which features disc brake on all four wheels. Features on offer with top trim of XUV300 are – dual tone roof rails, 17 inch diamond cut alloy wheels, front parking sensors which are the first in its class and a sunroof. Interiors are seen with a 7 inch touchscreen, dual zone auto AC, keyless entry, start/stop button, hill hold, leather seats / steering wheel, total of 7 airbags which include knee and side airbags as among its best in class features and auto dimming IRVMs. For more details about performance, here is our Mahindra XUV300 Review Test Drive. When compared to rivals, the XUV300 diesel is the most powerful car in the segment with 115hp / 300Nm. 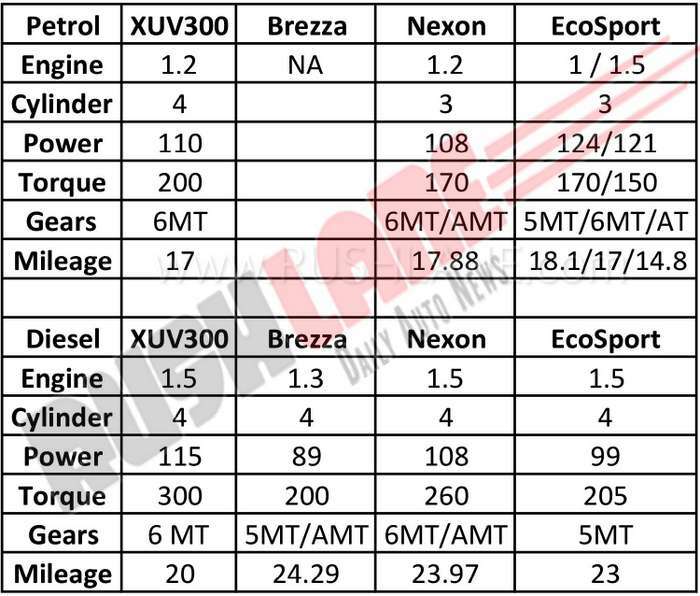 Next is Nexon with 108hp / 260Nm, followed by Ford EcoSport at 99hp / 205Nm, and last is Maruti Brezza with 89hp / 200 Nm engine. Yes, focus has been on delivering power and performance, this is why XUV300 also delivers the lowest mileage in the segment. 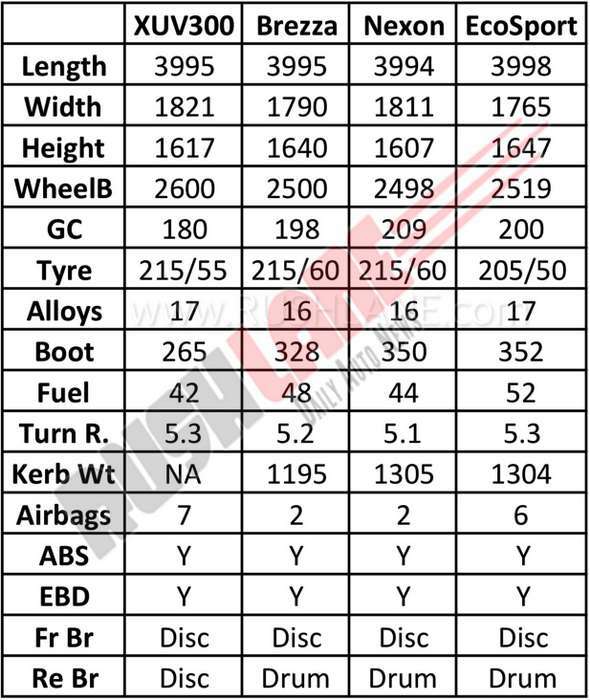 As per estimates, XUV300 is also going to be the most expensive car in the segment, along with most powerful and most airbags. It will be interesting to see how it performs on sales chart.